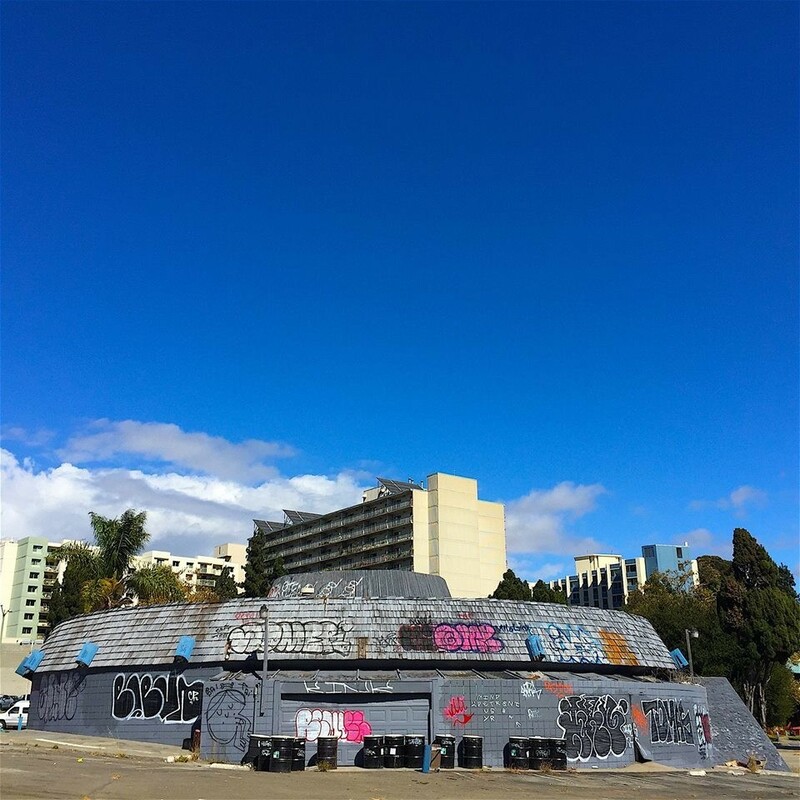 Before it was demolished, the Jetsons-esque building was beloved by generations of Oaklanders. If you’ve ever driven down Oakland’s Auto Row, you might have done a double-take at the odd, low-slung, circular building that sits at the intersection of Broadway and 27th Street, looking something like an abandoned spaceship, or a military bunker that had fallen into disrepair. Architecture buffs know the site as the former Biff’s Coffee Shop, a 24-hour diner that closed in 1996, and had been one of the Bay Area’s finest remaining examples of the futuristic “Googie”-style architecture that was popular in the Fifties and Sixties. Or it was, anyway, until the building was bulldozed this past October — on Halloween, in fact — to make way for a seven-story condominium complex. For now, all that’s left is an empty patch of dirt. Before it was lost to history, Biff’s Coffee Shop was one of The Town’s most distinctive-looking buildings. But more than that, it was a place that generations of Oaklanders loved — and more than just as an architectural oddity. Joyce Roy, a retired architect who helped spearhead a decades-long effort to preserve Biff’s, became familiar with the building during the early Nineties, when it was already somewhat of a shadow of itself. By that point, Roy noted, shingles had been added to the roof, whereas when the restaurant first opened, the exterior was completely smooth, adding to the Jetsons-esque, flying-saucer effect. But Roy recalls that, as soon as she walked inside, she fell in love. Of course, the diner’s most distinctive characteristic was its round shape. Inside, the tables were round, too, and there were cushy Naugahyde booths and windows that wrapped all the way around the building’s exterior. Naomi Schiff, a board member of the Oakland Heritage Alliance preservationist group, said she recalls going to Biff’s when she was in her twenties whenever she had a hankering for fast food late at night — it was, after all, one of a small handful of restaurants that was open past 10 p.m. The restaurant served what Schiff described as the kind of straight-ahead American diner food that’s somewhat hard to come by in today’s Oakland — “plenty of protein and starch, not a lot of vegetable matter,” as she put it. Schiff remembers bringing her kids to Biff’s for hot chocolate after swimming practice, and going there by herself sometimes at 5 a.m., when she needed a place to get some work done away from her kids. Mostly, though, what she remembers is the vibrant mix of people who frequented the restaurant, particularly during those hours before dawn — everyone from young partygoers still decked out in their “midnight finery” to auto repair shop guys coming in for a hearty breakfast before starting their work day. “It was a great cross-section of humanity eating some pretty plain food,” Schiff said. Many articles have been written about the long fight to try to save Biff’s, which started almost immediately after the diner closed in ’96. Chevron, which owned the property and had originally hired the Los Angeles-based firm Armet & Davis to design it, tried for a time to turn it into a “McChevron” — a combined McDonald’s and gas station, like the kind of thing you might find at a highway roadstop. The preservationists won that battle, but given the current real-estate market in Oakland, there was no winning the war. To this day, however, Roy remains convinced that Biff’s could, and should, have been saved.